Indians began voting in the world’s biggest election on Monday which is set to sweep the Hindu nationalist opposition to power at a time of low growth, anger about corruption and warnings about religious unrest. India’s 814-million-strong electorate are forecast to inflict a heavy defeat on the ruling Congress party, in power for 10 years and led by India’s famous Gandhi dynasty. Voting began at 7:00am (0130 GMT) in six constituencies in tea-growing and insurgency-wracked areas of the northeast, an often neglected part of the country wedged between Bangladesh, China and Myanmar. 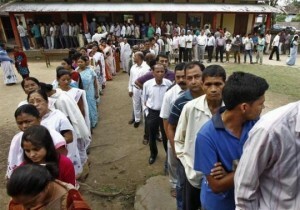 The nine-phase parliamentary election ends on May 12 and the results should be announced four days later. Santoshi Bhumej was the first woman to cast her ballot at a school which has been converted into a polling station for the day in Dibrugarh in the state of Assam. … The election will be the biggest in history and is a mind-boggling feat of organization as voters travel to nearly a million polling stations. In 2009, officials walked for four days through snow to deliver voting machines in the Himalayas, while yaks, camels and even elephants were pressed into action elsewhere in the vast country. Such is India’s population growth that 100 million people have joined the electoral rolls since the last vote five years ago. More than half of the country is aged under 25. It remains to be seen whether the system will halt the large volumes of low-priced food destined for Mercal markets that end up being sold in Colombian border cities, including Maicao and Cucuta. Venezuelan contraband food reportedly also is sold in Brazil and Cuba. Although the government has made efforts in recent months to seal the border with Colombia to restrict food contraband from leaving Venezuela, the diversion of subsidized food by hoarders and black marketers is partly responsible for 26% of basic food items having been officially classified as scarce by Venezuela’s central bank. Other reasons cited by analysts for food scarcities include the decline in recent years in farm production they say is caused by price controls that wipe out farmers’ profits. Another factor is the government’s cash shortage, caused in part by diminished oil revenues, which has restricted its ability to finance the imports on which Venezuelans depend for many basic food items, as well as toilet paper and disposable diapers. Also Tuesday, opposition leader Maria Corina Machado called for a rally to protest her being ousted last month as a member of the National Assembly [which is controlled by Maduro supporters]. The move by fellow legislators was upheld Monday night by the country’s supreme court. The court found that Machado deserved disqualification for having appeared before the Organization of American States last month as a temporary member of the Panamanian delegation to protest alleged human rights violations against demonstrators in Venezuela. Machado has stepped in to lead widespread protests against scarcities, inflation and the high crime rate after the unjust arrest Feb. 18 of former Caracas borough Mayor Leopoldo Lopez. On Monday, the government officially raised the death toll from nearly two months of protests to 39, with hundreds more people injured. More than 1,000 protesters have been arrested in disturbances in several cities. Two mayors also have been jailed for their alleged failure to keep streets free of blockades erected by protesters. Last week the government introduced a new “parallel” foreign exchange system that severely devalues the bolivar, the national currency. While the official exchange rate is still 6.3 bolivars to the dollar, the new system enabled those holding dollars to change them at nearly 52 bolivars to the dollar. Protesters also later seized the regional administrative building in Kharkiv, Ukraine’s second largest city, Interfax news agency reported. All three cities lie close to Ukraine’s border with Russia. Interior Minister Arsen Avakov vowed to restore order in eastern Ukraine without using violence and also accused Ukraine’s ousted president Viktor Yanukovich, whose political base was in Donetsk, of conspiring with Putin to fuel tensions. “Putin and Yanukovich ordered and paid for the latest wave of separatist disorder in the east of the country. The people who have gathered are not many but they are very aggressive,” Avakov said in a statement on his Facebook page. 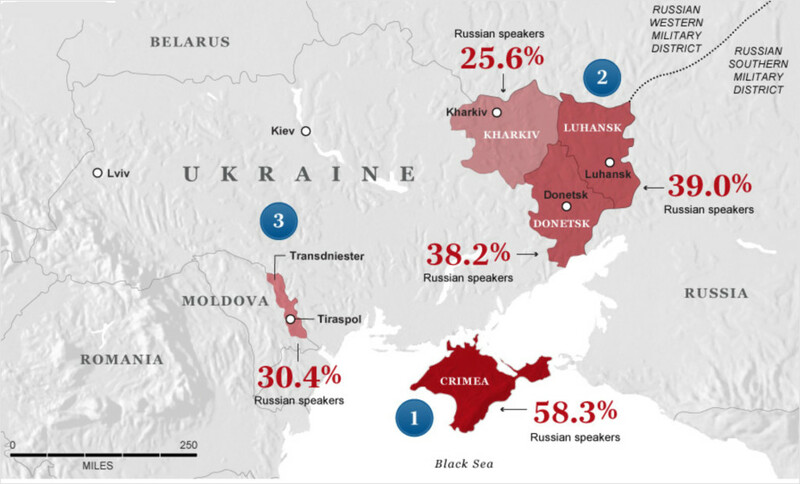 Mainly Russian-speaking eastern Ukraine has seen a sharp rise in tensions since Yanukovich’s overthrow in February and the advent of an interim government in Kiev that backs closer ties with the European Union. Russia has branded the new government illegitimate and has annexed Ukraine’s Crimea region, citing threats to its Russian-speaking majority – a move that has sparked the biggest standoff between Moscow and the West since the end of the Cold War. b) When does India’s parliamentary election end? d) Compare India’s electorate to that of the U.S.
e) How many people have been added to India’s electoral rolls since the last election in 2009? b) List the reasons for the scarcity of food in Venezuela. c) The socialist government of Nicholas Maduro has implemented a food ration card for shoppers they say to end food shortages by “preventing food hoarding” and people selling the food they buy from the government controlled (and subsidized) grocery stores on the black market. The government also says the food ration cards are voluntary. What is ironic about a voluntary food ration program? d) Critics of socialist President Nicholas Maduro are afraid he will set up a mandatory rationing system. Ask a parent what he/she thinks about Maduro’s attempts to incite class envy and to impose government control on private businesses. b) What did Ukraine’s Interior Minister Arsen Avakov say about the pro-Russian protesters who seized state buildings in three Ukrainian cities this weekend? c) The Obama Administration is again warning Russian President Putin that there will be consequences should Russia invade any more of Ukraine. Do you think U.S. admonitions and warnings will be effective in stopping Russia from going into Ukraine? Explain your answer. Religious tensions, an undercurrent to the election, which has mostly focused on development until now, burst into the open on Friday when an aide of hardline opposition leader Narendra Modi was accused of inciting sentiments. “Wherever these people (the opposition Bharatiya Janata Party – BJP) go they create fights. They’ll pit Hindus and Muslims against each other,” Rahul Gandhi warned on the eve of balloting. Prime ministerial front-runner Mr. Modi, the hawkish son of a tea seller whose rise has split his party, has a polarizing effect on the public due to his links to anti-Muslim religious riots in 2002. He urged voters on Sunday to give him a majority in the 543-seat parliament in defiance of surveys which repeatedly show the BJP likely to need coalition partners. “I need your blessings for a strong government and strong government means not less than 300 Lok Sabha (lower house of parliament) seats,” he said. After these first six constituencies in Assam and Tripura state cast their ballots, voting will take place in a further eight phases, and only finish on May 12. In Assam, a Congress party stronghold, some disgruntled voters told AFP they had been swayed by Mr. Modi’s promises of better infrastructure, strong leadership, jobs and a clean administration. Despite a decade under Congress when growth has averaged 7.6 per cent per year, a sharp slowdown since 2012 has crippled public finances and led investment to crash. The ID card, introduced by socialist President Nicolas Maduro this week, will limit Venezuelans to once-a-week shopping and will set off an alarm to halt any transaction if a purchaser breaks the rules. The government says they want to prevent individual shoppers from “over-buying” in a country hit by acute shortages of basic items including milk, sugar and toilet paper. Critics say it is an admission of failure of economic policy in one of the world’s big oil-producing nations. Clashes in Donetsk and similar rallies in the heavily Russified cities such of Lugansk and Kharkiv provided another reminder to the untested pro-Western leaders in Kiev of the monumental task facing them after their February 22 overthrow of president Viktor Yanukovych. The unrest comes with Ukraine’s borders surrounded by Russian troops who had earlier seized the Black Sea peninsula of Crimea and the economy in tatters after decades of mismanagement and government theft. Several eastern regions now want to stage referendums on joining Kremlin rule when Ukraine holds snap presidential polls on May 25. Both election frontrunners want to tie the vast country’s future to Europe and break its historic dependence on Russia. The day’s most violent protest saw nearly 100 activists move away from a crowd of 2,000 rallying on the main city square of Donetsk to storm and occupy the government seat where they raised the Russian flag. They threw firecrackers at about 200 riot police and ripped away several of their shields before raising the Russian flag above the 11-story building. A day after storming the regional government headquarters in Donetsk, a pro-Russian protest movement proclaimed an independent republic and called for a Crimea-style referendum to tilt to Kremlin rule. Talking to the crowd over a loudspeaker, protest leaders in Donetsk said they wanted regional lawmakers to convene an emergency meeting to discuss a vote on joining Russia like the one in Ukraine’s Crimea region that led to its annexation. A local Internet portal streamed footage from the seized building, showing people entering and exiting freely. Soviet-era music was being played over loudspeakers outside. The building houses the offices of Serhiy Taruta, a steel baron recently appointed by the interim government in Kiev as governor of a region with close economic and historical ties to Russia. “Around 1,000 people took part (in the storming of the building), mostly young people with their faces covered,” said Ihor Dyomin, a spokesman for Donetsk local police. “Around 100 people are now inside the building and are barricading the building,” he added. In Luhansk, Reuters television showed images of hundreds of people outside the state security services building and a policeman in riot armor being carried away on a stretcher. Ukraine’s state security services said on Saturday they had detained 15 people in Luhansk suspected of planning to overthrow the authorities and had confiscated hundreds of rifles, grenades and petrol bombs. Pro-Russian demonstrators have held rallies in recent weeks in several eastern Ukrainian cities, not far from a border where Moscow has assembled tens of thousands of troops. INDIA: India is a constitutional democracy with a parliamentary system of government. Read about India’s parliamentary system of government at wikipedia.org.